This is where the carcass has been placed now. It was pushed much further back towards the forest line. It’s a much better spot to set up the trail camera ( after I dig it out!). Further away from the surf line! I did get out today. It was too windy really,but I went anyways because I haven’t checked in on my Trail Camera in over a week! I swapped the SD card and continued on to Tsappee Narrows to see if anyone was home? The Daredevil was there but not very active. I than went back into the harbour. The sun is setting earlier now! I couldn’t get out sooner because of the wind. I had to wait until it died down alittle. Didn’t get much tonight folks,but I did upload the Trail Camera shots. Two new wolfs have appeared! 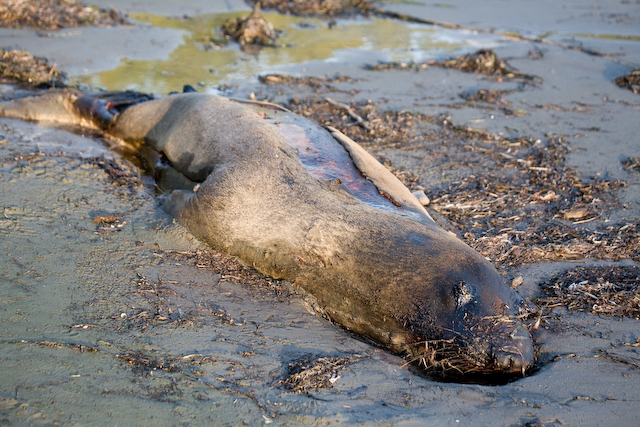 I heard from Rod Palm that there was a “fresh” dead (juvenile) Elephant Seal washed up on shore of Vargas Island! I quickly went over to check it out and sure enough,it was there! So were two young people………… camping ………about 100 meter’s away from it! I suggested that they should move away from the banquet but they seemed resigned to stay at least one night! I will go back over tomorrow with my Trail Camera & set it up for the show that’s about to start! I than went down to the Ginnard point area to check out the wolf situation and sure enough “Pepper” was there! Because of the high tide at that moment.I was able to get closer to their resting spot. He did a few poses and was off. I than went down to Tsappee Narrows to visit the Daredevil. He was active tonight & I was happy to see him! The light was great and getting out was even better!